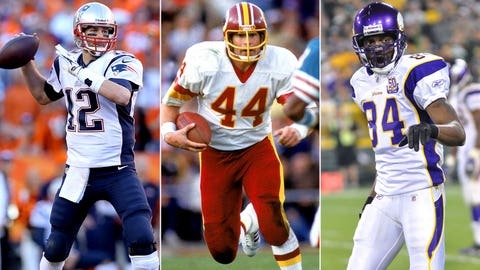 Tom Brady (far left), John Riggins and Randy Moss -- all shoo-ins for the Hall of Fame someday -- have combined for eight Super Bowls in their respective careers. Fox Sports South invokes a numbers-based look at the 40 Greatest Teams Not To Win The Super Bowl — a list that researches 48 NFL campaigns (1966-2013) and rewards overall record (regular season), per-game point differential, turnover margin, strength of schedule, divisional superiority, blowout victories … and any other bits of extra credit that may vault teams into the countdown. Simply put, we’re extracting the emotion from a countdown that will surely elicit a few choice responses on the "comments" section. But hey, you can’t please everyone. The one significant caveat: We only considered clubs with 10 or more wins from 1966-77 (the NFL had a 14-game schedule) and 11 or more victories from 1978-2012 (16-game schedule). It’s not a stretch to draw eerie parallels between the 1999 Jaguars and 2007 Patriots, the kingpins of this countdown (spoiler alert). Both clubs proffered double-digit excellence in point differential and turnover margin, while winning at least nine games by 10 points or more. The two head coaches, Tom Coughlin (Jags) and Bill Belichick (Patriots), are also direct descendants of the Bill Parcells coaching tree. And both teams, excruciatingly, lost to only one franchise during their near-flawless campaigns. Of course, New England (18-1) lost to the Giants in the waning moments of Super Bowl XLII … whereas Jacksonville went 0 for 3 against division rival Tennessee. In a nutshell, that explains why the Jags are sitting at only No. 20. The 1999 Titans may have been omitted from this countdown if Frank Wycheck and Co. had never pulled off the Music City Miracle against the Bills (wild-card round) — a ridiculous-looking, but legal lateral that saved Tennessee’s season and helped propel the NFL into a new century. But then again, it’s proper to celebrate the elite-level production of running back Eddie George (1,762 total yards, 13 TDs) and the Titans’ four crucial victories over the Jaguars (three times — including the AFC title game) and Rams (regular season), the eventual Super Bowl champions. The 1990 Niners were on path to becoming the first club in NFL history to win three consecutive Super Bowls — rolling for 10 straight wins to start the season, going undefeated on the road and riding high from perhaps Joe Montana’s best statistical season of a Hall of Fame career (3,944 yards passing, 26 TDs). But alas, a Montana injury and subsequent fumble from Roger Craig in the NFC title game (against the Giants) thwarted San Francisco’s bid for three straight Lombardi trophies. At first blush, the 1975 Vikings got the short end of the stick here. Is a top-20 ranking really commensurate for a Minnesota squad that started the season 10-0 and allowed only 22-plus points once that year? The ’75 Vikings played in a noticeably weak NFC Central and faced zero playoff opponents that regular season. It also doesn’t help that Minnesota got booted from the playoffs by 10-4 Dallas, via the famous Hail Mary play. What a shame. The Vikings could have gotten revenge on the Steelers in Super Bowl X … but it simply wasn’t meant to be. On the heels of a remarkable 2009 campaign with the Vikings (4,202 yards passing, 33 TDs), Brett Favre was one across-the-body interception away from leading Minnesota to its fifth Super Bowl. For the season at large, the Vikings were an offensive machine, netting a ho-hum, all-world year from running back Adrian Peterson (1,819 total yards, 18 TDs) and collecting 25 touchdowns from complementary assets like Percy Harvin, Visanthe Shiancoe and receiver Sidney Rice (83 catches, 1,312 yards, eight TDs). In hindsight, this might have been Favre’s most complete team of his vaunted NFL career (1991-2010) — after the 1996 Packers (Super Bowl champs). After Minnesota’s bye week in 2009, the defense allowed just 10 points or less six times. We would love to reward the 2001 Rams (1st in scoring, 1st in point differential, 8-0 road record, 6-1 against playoff teams) with a top-10 ranking, but it’s hard to look past the club’s minus-10 output in turnovers. When grading the NFL’s greatest teams of the Super Bowl era without a curve, you won’t find another one that invoked such a sloppy approach to closing out games — especially one playing in a bone-dry dome. Yes, QB Kurt Warner (4,830 yards passing, 36 TDs), tailback Marshall Faulk (2,147 total yards, 21 TDs), Torry Holt (81 catches, 1,363 yards, 7 TDs) and Isaac Bruce (64 catches, 1,106 yards, 6 TDs) registered monster numbers in Mike Martz’s explosive offense, but there’s really no justification for 38 forced fumbles and 22 Warner interceptions. Peyton Manning (4,557 yards passing) set the sports universe ablaze during the 2004 campaign, amassing a then-NFL-record 49 touchdown passes for the Colts — besting Dan Marino’s 20-year-old record of 48 TDs in 1984. As part of that prolific passing success, Indy enjoyed 10 games of 30-plus points, including six consecutive outings of 30 or more points from Weeks 8-13. Sure, the Colts captured the Super Bowl crown one year later. But the 2005 club stands out as Indy’s best team of the Peyton Manning era. Indy opened with 12 straight wins, posted a 5-1 mark against playoff teams, tallied nine blowout victories and enjoyed a symmetrical bonanza in point differential (+12) and turnover margin (+12). The only things missing from that special season: A battle-tested kicker (Mike Vanderjagt) and a bit of good fortune after goal-line fumble recoveries (Ben Roethlisberger’s season-saving tackle off Jerome Bettis’s gaffe). There’s plenty to love about the 1998 Falcons, from their perfect home record and monster turnover margin (+20) to the eight decisive victories against top-notch competition. Throw in a major upset win in the NFC title game (over the Vikings) and a respectable loss to John Elway’s greatest Broncos team (in Super Bowl XXXIV) … and you have one of history’s most undervalued clubs. The reasoning behind the Falcons’ lack of respect? Their three biggest offensive weapons were QB Chris Chandler (3,154 yards passing, 25 TDs), tailback Jamal Anderson (2,165 total yards, 16 TDs) and wide receiver Tony Martin (1,181 yards, six TDs). The 1992 Niners were as dynamic as their dynastic forebears of the 1980s, with Steve Young succeeding Joe Montana at quarterback and George Seifert seamlessly handling the coaching reins after Bill Walsh retired from the pro game in February 1989. Looking at the numbers, the ’92 Niners earned strong marks in point differential (10.4), turnover margin (7), blowout wins (8) and overall record against playoff teams (5-1). For good measure, Young and Co. capped the regular season with eight straight victories — a necessity for holding off the eventual champion Cowboys in the race for home-field advantage throughout the NFC playoffs. Ultimately, Dallas didn’t need Texas Stadium to capture its first NFC championship in 14 years. The 1967 Rams, led by QB Roman Gabriel and the Fearsome Foursome (Lamar Lundy, Roger Brown and Hall of Famers Merlin Olsen and Deacon Jones), enjoyed a sublime regular season — 10 blowout victories, one signature win over the eventual champion Packers, plus impressive margins with point differential (14.4) and turnovers (+16). Simply put, this might have been the Rams’ second-greatest team of their 48-year tenure in Los Angeles (after the 1951 NFL champions — led by the immaculate QB tandem of Norm Van Brocklin and Bob Waterfield). But ay the rub: Due to the NFL’s archaic system of scheduling playoff games in the 1960s (rotating division hosts every year), the 11-1-2 Rams had to travel to Green Bay for the NFL semifinals, even though Los Angeles had a better record and the previously mentioned win over Green Bay for Week 13). Of the last 50 years, it may stand as the NFL’s greatest miscarriage of justice, logistically speaking. The ’04 Steelers are the worst 15-win team of the bunch. Humor aside, there aren’t enough superlatives to describe the balance between the Pittsburgh defense, ranked No. 1 in scoring that season, and the offense helmed by rookie QB Ben Roethlisberger (2,621 yards passing, 18 total TDs) and veteran RB Jerome Bettis (13 TDs). Following a Week 2 defeat to Baltimore, Big Ben and Co. ripped off 14 straight victories to finish the regular season. The Steelers were similarly stellar in three major areas: Turnover margin (+11), blowout victories (eight) and 3-0 against playoff teams. Similar to the 1979 Chargers, Pittsburgh posted easy regular-season wins against the future Super Bowl combatants — New England and Philadelphia (back-to-back weeks). The planets were aligned for head coach Marty Schottenheimer to experience a career breakthrough in 2006. The Chargers had a top-flight quarterback (Philip Rivers), formidable defense, supremely talented kicker (Nate Kaeding), the NFL’s single greatest weapon (LaDainian Tomlinson — 2,323 total yards, 31 TDs), home-field advantage in the AFC playoffs and a path to the Super Bowl that didn’t involve the notoriously stingy Ravens. But a crushing loss to the Patriots in the divisional playoff round — where the Chargers couldn’t retain possession of a crucial Tom Brady interception in the game’s final moments — forever (and unfairly) sealed Schottenheimer’s fate as a coach who couldn’t win The Big One. But that’s a shallow perspective for this survey, given the Chargers’ 14-2 mark, definitive margins in point differential and turnovers and plum spot atop the highly competitive AFC West. The 1990 Bills ruled the AFC through fear … and a devastating, quick-strike offense (27 points per game) that had no peer. Behind Hall of Famers Jim Kelly, Thurman Thomas and Bruce Smith (sorry, Andre Reed — for now), Buffalo enjoyed a problem-free run to the East title and AFC championship, thumping the Dolphins and Raiders in the playoffs before suffering a gut-wrenching loss to the Giants in Super Bowl XXV. But that franchise-defining defeat — capped by kicker Scott Norwood’s wide-right miss with seconds to spare — doesn’t obscure double-digit excellence in point differential and turnover margin, nine blowout victories or a 4-2 mark against playoff teams (including the Giants in December). Unfortunately for Buffalo, New York got its revenge in January. The 1982 Dolphins reached Super Bowl XVII on the strength of a dominating defense, affectionately dubbed The Killer B’s. But when Miami reached The Big Game two years later, it had seamlessly morphed into an offensive machine, coinciding with the emergence of receivers Mark Duper, Mark Clayton and QB Dan Marino, who would break new ground with 48 TD passes in 1984 (an NFL record that stood for 20 years). With Marino (the sixth QB taken in Round 1 of the heralded ’83 draft) leading the charge, the ’84 Fins were virtually unstoppable, notching 10 blowout victories and a sizable point differential (13.4). The only drawbacks: In Week 11, Miami suffered its first loss to an underwhelming San Diego club (in overtime); and in the AFC playoffs, the Dolphins were fortunate to avoid the defending champion Raiders (knocked out in the wild card round). Tom Brady has reached the Super Bowl five times in his career, but the 2010 Patriots might have been his most balanced club over a 12-year period. Brady threw for 3,900 yards and 36 TDs (against only four INTs) and cruised to NFL MVP honors. Tailback BenJarvus Green-Ellis rushed for more than 1,000 yards and 13 TDs — while deftly sharing the rushing load with Danny Woodhead, Fred Taylor, Sammy Morris and Kevin Faulk. Pass-catchers Wes Welker, Deion Branch, Rob Gronkowski and Aaron Hernandez each tallied 700 yards or six touchdowns. And the typically bland New England defense allowed only 313 points — with seven or fewer points in four of its last five regular-season games. But the true greatness of the 14-2 season lies with Brady, who led the Patriots to 30-plus points in eight straight games — a feat replicated by Peyton Manning and the 2013 Broncos (Weeks 1-8). At the very least, the 1976 Steelers are the greatest team to start 1-4 in any NFL season. In their final nine regular-season outings — all Pittsburgh victories — the famed Steel Curtain defense surrendered a TOTAL of 28 points (or 3.1 per game), a ferocious, awe-inspiring run that included three consecutive shutouts (an NFL record). In the playoffs, the Steelers demolished the Colts in Baltimore, 40-14 … before bowing out to the eventual champion Raiders in the AFC title game, a consequence of playing without injured running backs Franco Harris and Rocky Bleier. On the flip side, Pittsburgh lost to every playoff-bound foe during the regular season and was a pedestrian 4-3 away from Three Rivers Stadium. But for us, ’tis better to stay on Jack Lambert’s good side. The No. 6 ranking seems great … until you realize that heading into December 2011, many pundits were hailing Green Bay as a viable candidate to go 19-0 and assume the mantle of Greatest Team In NFL History. But a Week 15 loss to the lowly Chiefs and divisional-playoff home defeat to the Giants quickly softened the perception of the Packers, an offensive juggernaut but mere mortals on the defensive end. Still, what’s not to love about 560 seasonal points (just shy of the 2007 Patriots), 11 games of 30-plus points, a stellar turnover differential (+24) and sterling 6-0 mark against 2011 playoff clubs? Of course, that unblemished status doesn’t include the devastating postseason loss to the Giants, but the Packers aren’t the first dominant team to be unhinged by New York in the playoffs. Of equal relevance, the offense didn’t supremely click until after backup QB Randall Cunningham (3,704 yards passing, 35 total TDs) took over in Week 3 (due to Brad Johnson’s injury). Ultimately, Minnesota ‘s championship hopes were dashed by Atlanta in the NFC title game — remember Gary Anderson’s only missed field goal in a two-year span? — precluding a titanic clash with the eventual champion Broncos in Super Bowl XXXIII (John Elway’s triumphant swan song). The 1969 Vikings achieved the rare triple crown of leading the NFL in points scored (379), points allowed (133) and per-game point differential (17.6). Throw in nine blowout victories, a perfect mark against 1969 playoff teams and three outings of 50-plus points … and we’re talking about one of the greatest single seasons in league history. In Week 1 of the 1970 campaign — roughly eight months after the Super Bowl debacle and the inaugural season of the NFL-AFL merger — Minnesota exacted some revenge on Kansas City, rolling to an emotionally charged 27-10 win in Bloomington (Minneapolis). From a regular-season perspective, the 1983 Redskins trump nearly all comers in this countdown. The only thing preventing a No. 2 ranking is quite obvious: It’s hard to lose 38-9 in Super Bowl XVIII (to the Raiders) and expect glowing recollections from everyone in the NFL universe. Looking at the numbers, the 1998 Vikings had a better overall record, more points scored and one additional blowout victory. But the Redskins, led by QB Joe Theismann, John Riggins, Art Monk, rookie Darrell Green and head coach Joe Gibbs, prevailed in the end, thanks to an eye-popping turnover margin (+43), a 5-1 mark versus playoff teams (including a win over the eventual champion Raiders that October), two one-point defeats and an actual Super Bowl appearance. There’s also this consolation prize: The 1983 Redskins are the greatest defending Super Bowl champs not to repeat the following season. For uniformity purposes, Baltimore’s offense also accounted for 27 or more points 10 times. 1) The AFL never earns the pre-merger respect of the NFL. 2) Coach Don Shula likely doesn’t feud with Colts owner Carroll Rosenbloom and bolts Baltimore for the still-in-expansion-mode Dolphins in 1970. 3) Newly minted celebrity QB Joe Namath never gets the chance to visit Bobby Brady, on his phony death bed, in a campy but memorable episode of TV’s The Brady Bunch. 4) Even worse, Namath never inks a landmark deal to endorse pantyhose for Beauty Mist in the mid-70s. The Patriots’ perfect regular season in 2007 was more than just an unblemished record. It was an across-the-board reckoning for a club that genuinely wanted to win every game 45-7, no exceptions. How else should one reconcile otherworldly production in point differential (19.7), turnover margin (+16), wins by 10 points of more (12) and a 6-0 mark against playoff teams — including three division winners? But alas, there’s a fine line between being universally hailed as the greatest club in NFL history (on the precipice of 19-0) … and begrudgingly accepting one writer’s meaningless award for Best Team Not To Win A Super Bowl. It’s a consequence from the ultimate bittersweet season. On the positive side, Tom Brady set a then-NFL record with 50 touchdown passes, with Randy Moss also collecting an NFL-record 23 TD receptions. And realistically speaking, only the Ravens and Giants had fourth-quarter opportunities to spoil the Patriots’ run of perfection during the regular season — a stunning achievement in a parity-driven era. But a loss in Super Bowl XLII slightly downgrades New England’s once-in-a-generation dominance from September-December … to a simple footnote in NFL history.